The American Kestrel is a diminutive falcon and is commonly known in falconry. This dynamic little falcon is one of the first allowed to American apprentice falconers. The American Kestrel, also known as the “Sparrow Hawk” or “Kestrel Hawk” is one of the most vocal raptors. Their voices are high-pitched and very fast; their call is described as sounding like “klee, klee, klee” or “killy, killy, killy”. 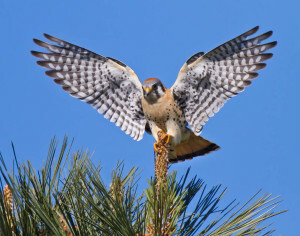 In the wild, the American Kestrel prays primarily on small rodents and insects. They have also been known to prey upon amphibians, snakes, other birds, and worms. Their native habitat includes farm areas, prairies, wooded streams, deserts, rural hedgerows, and they are also seen on roadsides. This raptor seems to have adapted very well to humans and is not uncommon in cities. If you look at power lines, it is not uncommon to see a Kestrel perched atop them in preparation for the hunt. 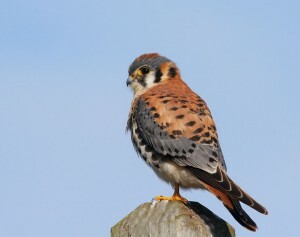 The American Kestrel is also seen perched on posts, trees, and poles. This Kestrel seems to need places to perch for hunting, in addition to the wide-open areas they seem to love. Unlike many raptors, the Kestrel seems to have benefited from agriculture. Their numbers continue to grow as farmlands increase. Unlike some migratory raptors, the American Kestrel does not seem to mind the cold and is often seen spending the winters near their home ranges. The American Kestrel has the ability to hover, with rapidly beating wings. 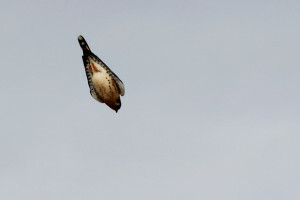 This hovering ability is an easy way to identify a Kestrel from other falcons. The American Kestrel is a fast flyer, achieving speeds of 40mph. This speed allows him to easily catch prey in flight. The American Kestrel is a very small falcon, one of the smallest of the common falcons. At maturity, they will generally weigh only four ounces and measure nine to twelve inches in length. The only smaller Falcon is the Seychelles Kestrel, which is found in Europe. Like all falcons, they have distinct falcon facial markings including the ‘mustache’ and ‘sideburns’. On the American Kestrel these markings are black or dark brown. The Kestrel is easily distinguished by the presence of double black stripes on a white face. Their backs and tails are decorated with rust plumage. They are the only falcons to have rust colored backs. The tail is relatively long with a much narrower tip and is marked by terminal black barring. They have dark eyes with a dark vertical line running through them, unfeathered legs, white chin and cheek patches, and a notched beak. Their heads have blue plumage on the tops with a rust colored cap. Male and female American Kestrels can be easily distinguished by their different markings. The male Kestrel has grayish blue wings, while the females are rust colored. The rusty head cap is generally brighter in males than in females. The male also has very distinct color markings, which are uncommon among raptors. The male has a buff colored chest with small black spots on the side. Both American Kestrels have long slender wings, with underside plumage light brown with darker brown streaks. Females are generally larger than males. 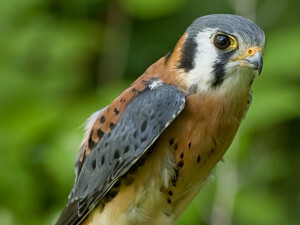 The American Kestrel is common in North and South America. In the past, the Kestrel was often called the Sparrow Hawk. Since the Kestrel is a falcon and not a hawk, this name really does not fit at all, and is not often used today. The Kestrel’s status in the wild is good; they are not endangered. Today there are an estimated 1.2 million breeding pairs in North American alone. 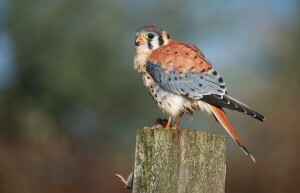 It should be noted that there is a subspecies of American Kestrel in Florida that is classified as threatened. Keeping captive falcons is one of the few sports/hobbies that is carefully regulated by the United States Federal government. The same holds true for many other countries as well. If you want to keep an American Kestrel, it is crucial that you check with your federal government and local state and city governments for the proper licensing and permit information. The Kestrel is more difficult to care for than the Red Tailed Hawk. This is because they have very fast metabolisms and weight maintenance can be tricky. It is very important that captive Kestrels be fed daily. If you have the necessary permits and licenses required for keeping the American Kestrel, you are now ready to prepare his housing. He should have both an indoor and outdoor facility. The regulations for the facilities will vary from state to state and country to country. The following information is general, and you should check with your government agencies for the exact specifications required in your area. The indoor facility is referred to as a “mew”. It should be plenty large enough to allow the Kestrel to extend his wings fully. It is important that all wall surfaces be smooth and not abrasive. It should also contain at least one window. It is important that the window be protected from the inside by strong vertical bars. For obvious reasons the spacing between the bars should be smaller than the width of the Kestrel’s body. To prevent escaping make sure all windows and doors can be easily secured. Perches are needed and should be designed specifically for smaller falcons, like the Kestrel. If they are too large, he will not be able to perch comfortably. The outdoor facilities are often called the “weathering area”, this area should be covered with wire or netting, or roofed so that the Kestrel is not bothered by other animals. In some cases, an uncovered area can be used, if each perch is at least six and a half feet high. 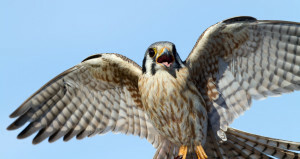 The area should be large enough so that the tethered Kestrel does not injure himself, by striking the sides or the roof, when flying from a perch. It is important not to allow prolonged exposure to the sun or other elements. Perches in this area, like the mews, need to be of the correct size for Kestrels. Some falconers will build combination mew/weathering areas for their Kestrels. Some other common equipment seen in falconry are leashes, bells, tracking devices, swivels, jesses, and weighing devices. In the wild, the American Kestrel does not make his own nest. It is common for them to use empty magpie nests, woodpecker cavities, holes within saguaro cactus, cliff sides – in more domestic areas niches in buildings, or specially made nest boxes. The Kestrel is described as a “cavity nester”. The male will display a special gliding flight to attract a female’s attention to a potential breeding site. After mating, the female will lay three to five near-white, spotted eggs. The spotting is generally light brown. 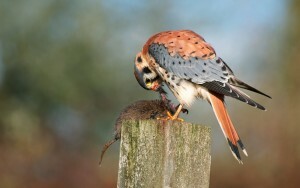 An unusual trait among Kestrels is that the male will sometimes help with incubation. This is not common behavior among most raptors. Incubation usually lasts for a month. The baby Kestrels grow very quickly and reach adult weight within only two and a half weeks. They will leave the nest and begin to fly within a month. Kestrels have been reported to raise as many as two broods a year in some southern American states. Some interested hobbyists have constructed nest boxes to encourage Kestrel breeding. These nest boxes should closely mimic their natural environments. For the American Kestrel, the opening hole for the nest box should be three inches in diameter and the height of the entrance hole should be 10 to 12 inches from the floor of the box. The interior height of the nest box should be 8 to 10 inches, with a floor diameter of nine inches by nine inches. The box should be placed 12 to 30 feet from the ground, to attract them.